The Brazos Theological Commentary series enlists “leading theologians [to] read and interpret scripture for today’s church, providing guidance for reading the Bible under the rule of faith.” The emphasis is upon a theological and unashamedly “Christian” interpretation. This pushes back against attempts for “objective” historical readings stripped of tradition. The choice of commentator is unique, such as philosophers, theologians and historians of varying traditions. 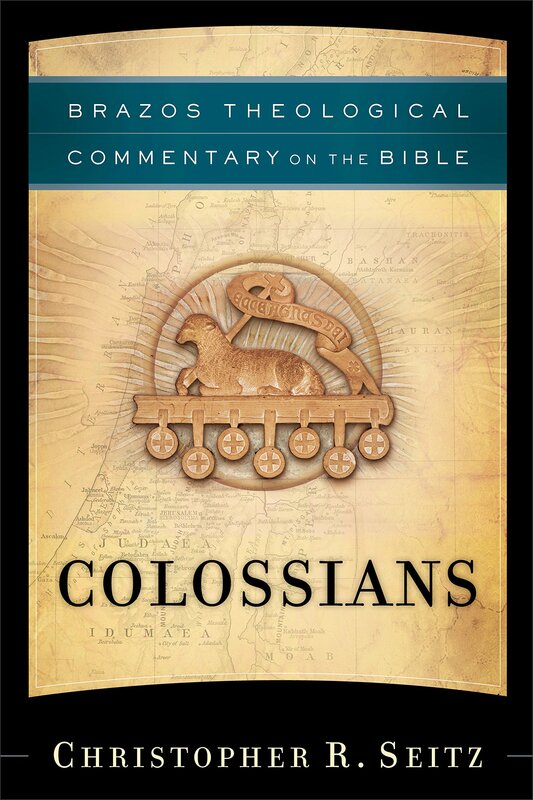 The Colossians volume is by Christopher Seitz. Seitz an OT scholar with expertise on canonical reading of Scripture. The result is a fresh reading of Paul’s letter. A proper Christian interpretation avoids the “amnesia of the present age” (p19) by considering the entire 2,000 years of interpretive history. The “history” of a text includes not only its original setting, but other factors such as its placement in the canon. Colossians is given to us in the context of Paul’s letter collection and we must interpret it in this context. The usual questions are asked in the introduction, but with important differences. When it comes to setting, Seitz is less concerned with typical matters such as the city of Colossae, its church, the nature of the false teaching, and so on. For Seitz, modern scholarship’s fixation on these is mistaken “because the canonical portrayal is frankly of a different sort of presentation” (p25). In other words, the usual questions asked of the text are difficult to answer because these are not forefront concerns in the NT text itself. We are asking of Scripture what Scripture has no concern to answer. So rather than asking history “where”, Seitz asks that question of the canon: where does Colossians sit in the canon? Seitz argues that, beginning with Ephesians, the Pauline collection hangs on his imprisonment. Thus, we ought to seek “the theological significance of Paul’s imprisonment” (p30). This brings about questions of occasion (the “why”). Since Colossians can be read by other churches with profit (Col 4:16), the occasion for writing “cannot be the specifics of a problem Paul is concerned about and solely that” (p33). This releases Colossians of its most difficult feature: we simply don’t know much about its historical setting. Instead, Seitz looks within Colossians, and finds that the most overlooked passage (Col 1:24-2:5) provides the answer. Paul, in his imprisonment, “has become aware that his letter writing is a form of apostolic ministry” (p37). 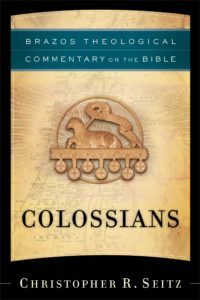 Next, Seitz asks the relationship of Colossians to the Old Testament. Seitz finds intriguing parallels between Paul’s thirteen-letter collection and the Book of the Twelve (“minor prophets”). Both share the concern of passing on inspired word to a new audience. It’s noteworthy that Colossians never quotes the OT, but drawing from the recent works of Beale and Beetham, allusions certainly abound. Paul stands alone as canonical author of the thirteen letters, and how that is so is less prominent in the presentation than that it is so. To introduce an alternative understanding in the name of modern conceptions is to fail to accept the limitations of modern inquiry into what is scriptural convention. So far I have only addressed the introduction of the commentary. This is not because the commentary proper is uninteresting or bland, but that it’s important to see the unique course set by Seitz in the introduction. This canonical approach impacts his interpretation significantly. For example, Seitz has little interest in identifying the “Colossian Heresy” (Mystical Judaism? Syncretistic folk religion? Proto-Gnosticism? ), and reads Paul’s statements universally as emphasizing Jesus over practices and experiences. Some will see this interpretation as historically insensitive. However, such a reading is shown to be historically aware in another way: the history of interpretation. Seitz regularly draws from early Christian writings who have read the letter as universally applicable. What’s more, Seitz is unafraid to interpret Colossians in light of Paul’s other letters. Put simply, Seitz is not interpreting the Colossians that was delivered to an ancient church in Colossae, but the Colossians that we have in the canon. I must admit, I find myself drawn to the canonical approach of Seitz and others (e.g. Trobisch). However, I have seen much discussion about method, but less of the payoff, so I highly enjoyed how this commentary put the concepts into practice. Perhaps my largest criticism of the commentary is Seitz’s oft-labyrinthine writing style that regularly requires several re-readings to understand. As a volume that attempts to chart its own course inspired by a theological interpretation, Seitz’s Colossians does not disappoint. I would highly recommend it be read alongside any more “traditional” (read: modern!) commentary, such as Moo, Bird, or Dunn. I certainly found it stimulating and provocative. There’s nothing quite like it.